The heart speaks fearlessly when we can be brave enough to listen. Fearless Heart Flow is a hybrid yoga, meditation and writing workshop that offers the opportunity for you to connect to your fearless heart. 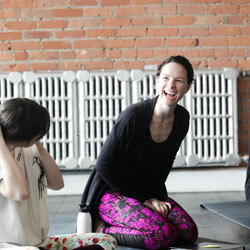 Nicole Catenazzi (E-RYT 500), passionate writer and heartfelt yoga teacher from Toronto, Canada, will guide you through movements that will unblock physical and emotional tension in your body, plus meditations and expressive writing exercises designed to tenderly meet and release your fears. Don’t miss this incredible opportunity to experience Fearless Heart Flow! This is the only offering in the United Kingdom this year. – Intuitive movement beyond the confines of your yoga mat. – Focused meditation connecting you to your body, heart and soul. – Expressive writing prompts that invite you to let go of judgment and express yourself openly. What is expressive writing? Expressive writing is a journaling technique in which a person writes continuously for a set period of time without regard to spelling or grammar. It can produce raw and revealing insights and is helpful in overcoming blocks of self-doubt and self-criticism. What to bring: a yoga mat, journal and pen (no previous yoga or writing experience required). Early bird special! Get £5 off when you register before April 15.